Based on the figures read out in Parliament last Thursday by Prime Minister and Minister of Finance Dr. Ralph Gonsalves, there is a deficit in the current balance of EC$37.1 million compared to the $3.8 million surplus in 2010. Gonsalves was responding to the question posed by Leader of the Opposition Arnhim Eustace to give a comparison of the fiscal situation between this year and last. The prime minister gave the figures through July 31: total revenue and grants in 2011 was EC$284.128 million compared to $289.9 million last year. Current revenue for this year is EC$255.4 million while it was $284.1 million in 2010. Total expenditure through July 31, 2011 was $318.42 as opposed to $310.23 last year. Recurrent expenditure was $294.53 million this year and $280.24 million in 2010; and capital expenditure was $23.88 million this year and $29.9 million last year. The current balance showed a deficit of $37.1 million compared to a surplus of $3.8 million last year and the total balance for 2011 stood at $34.2 million this year and $20.3 million last year. The prime minister, however, noted that in July 2011, there was a surplus of $504,000 in the current balance, with an overall balance of $11.57 million, which he said was better than July 2010. However, this prompted the Leader of the Opposition to ask the prime minister a supplementary question. âDespite what the prime minister said in respect to July, the fact remains that the current balance is negative to the extent of $40.8 million, as compared to the same period of 2010. This will suggest that there is need for some action,â Eustace said. Gonsalves responded that his government had a series of planned actions, saying that he budgeted for a $27 million current account deficit for this year. âTake for instance, we deliberately spent another EC$4 million for persons on public assistance,â he explained. He contended that he did not have to give the $4 million in public assistance, but did it because he knew that there was going to be an increase on items including fuel, cooking gas and on basic food supplies including flour, sugar and rice. âThose things had nothing to do with the Government of St. Vincent and the Grenadines, but I have to try and protect the poor and protect certain kinds of programmes,â the prime minister explained. He further explained that he had to now manoeuvre through financial constraints internationally, while giving the assurance that his government was being very careful with its spending. âBut I canât really make the poor, somebody I helped to take out of poverty, I canât see them go back into poverty. I have to keep the safety net,â Gonsalves said. He spoke of the damage to the countryâs infrastructure, which stemmed from Hurricane Tomas in 2010 and the floods earlier this year. 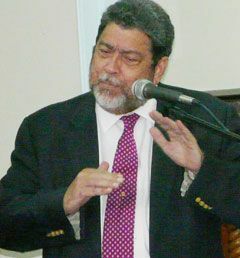 Gonsalves said that he was going to remain âprudent and enterprisingâ and that was how he had to do it. âI have to deal with the situation creatively,â he said.